Installing laminate stair treads should be done before each riser is installed in order for the riser to set on the tread. Here in this step I am connecting the two laminate planks together and installing them as one tread. 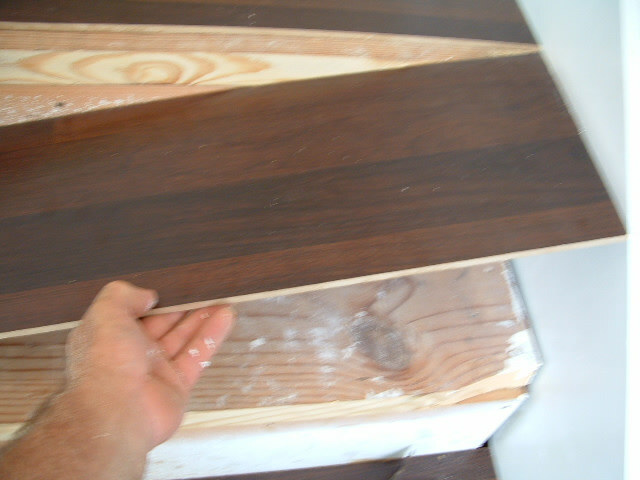 I cut the planks in equal widths so the joint will fall in the middle of the tread. The alternative would have been one full plank and a small piece to cover the tread. You can do it either way I just wanted the stairs to be the same. 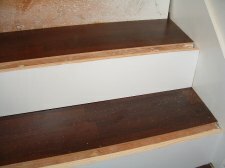 I don't like to have end joints on the stairs either, I want the treads to be as rigid as possible. In this photo is the tread I am installing. 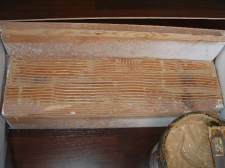 I am using wood glue here to glue the tread down. The actual glue I used here is Parabond Millennium series 2002,engineered wood adhesive. Urethane glue could be used also but it is more costly. 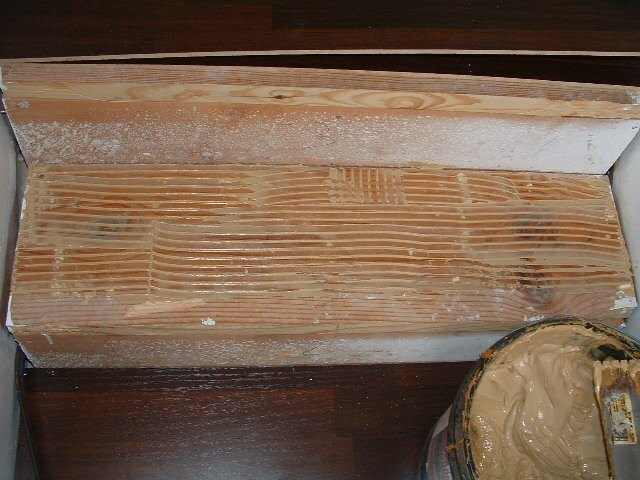 You could use construction adhesive but it may not give you full contact to the surface your gluing to. I am not using too much glue. This is a V-notch trowel. You can see the amount of glue on this stair after I spread it. Notice I don't put the glue to the edge of the stair, only where the tread is going. I will use construction adhesive here on the edge where the stair nose will go. Here I am dropping the tread into the glue. With this particular glue I didn't have to wait for it to set up. 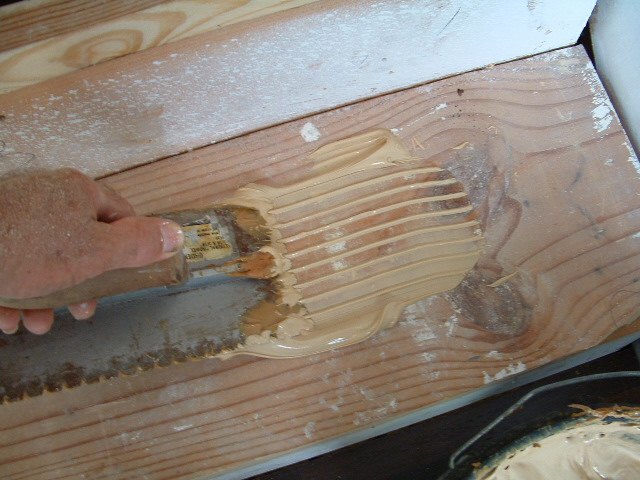 After the tread is lowered into the glue I use a nail gun with 2 inch nails 18 gauge ( a thinner nail) and nail along the front edge of the tread. You can also nail with a hammer if you do not have a nail gun, it can be tedious this way. I use a sample of the stair nose to make sure the nails will be covered. You don't have to nail the treads if you don't want to, I do it to make sure the tread will not move while I am working on them. 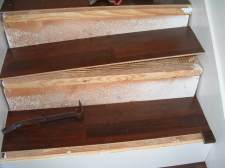 If you decide not to nail them you may have to glue the treads and wait overnight for the glue to set up before you continue. Just be careful walking on them when the glue is still wet. I nail along the back of the tread here. The riser will cover the nail holes here. 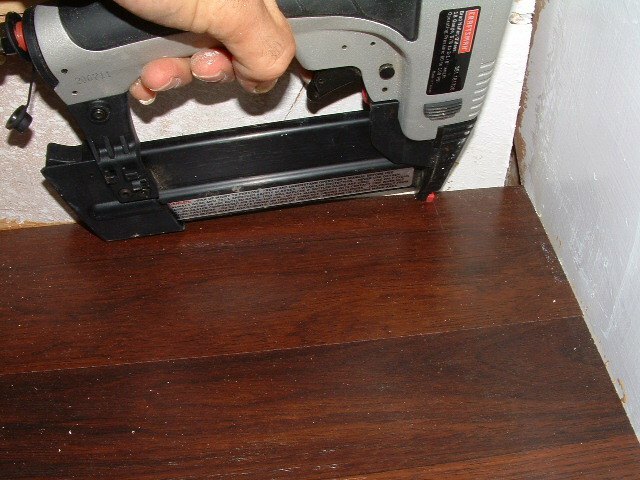 If you are using laminate flooring as the riser make sure that you nail as close to the edge as possible so the laminate riser will cover the nail holes. You can install all the treads and then come back and install the risers. 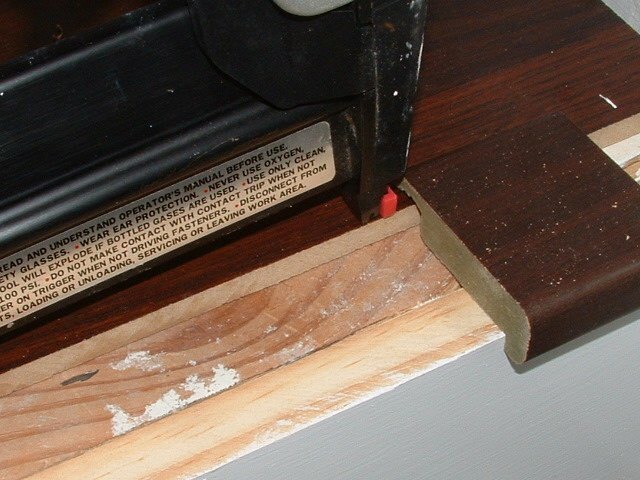 Don't forget to use a sample of the riser to make sure the stair nose will be positioned properly.